As a mom of three children, there is nothing more rewarding than walking alongside my kids as they grow in their relationship with Christ. Whether reading the Bible or attending church on Sundays, I’ve come to place so much value on experiences we have as a family that connect us more deeply with Scripture and help us grow together. My passion for connecting people to the Bible was cultivated early in my own childhood. I grew up in our family’s business. My grandfather went from producing milk as a dairy farmer to producing live stage shows with a purpose. He was passionate about helping people see and understand the Bible as he did: full of life and creativity. Deeply motivated by the way Jesus used parables to help people connect to scripture, he used what he had to begin doing the same. Armed with a camera, slide projector and passion for the gospel, he began creating experiences for families to share together that connected them to Bible stories. What started as a small multi-media show grew into the Sight & Sound Theatres that exists today: two state-of-the-art venues in Lancaster, Pa. and Branson, Mo. where Bible stories come to life on a panoramic stage with massive sets and live animals (not to mention our signature roasted almonds which are an experience of their own!). A lot may have changed in our 42-year history, but one thing remains the same: our passion for bringing the Bible to life. We realize not everyone may be able to visit us in person, so this April we’re “taking the show on the road.” For three days, our landmark production NOAH will be playing in movie theaters nationwide! We’re thrilled about the idea of thousands of people across the country experiencing this cherished Bible story together in their own backyards. If you’re making plans to bring your family, I’d like to recommend reading the story together before embarking on your excursion (found in Genesis 6-9). Noah had to make a hard decision and was ridiculed for it. Was there ever a time that you had to make a decision that wasn’t popular? Noah had to trust that God was going to deliver on His promise even when he couldn’t see the outcome. Was there a time you had to trust God in your own life when you didn’t know what would happen? God’s faithfulness is evident throughout Noah’s whole life. How have you experienced God coming through in your life? We invite you to set sail with us in April to experience this extraordinary Bible story full of animals (two-by-two! ), a monumental flood, and (spoiler alert! ), a rainbow for the grand finale! Our hope is the story will come to life for your family in a brand new way. We can’t wait to see you there! Seen by more than 5 million people live on stage, Sight & Sound’s landmark production sets sail into movie theaters April 9, 11, and 13 for a special nationwide event. 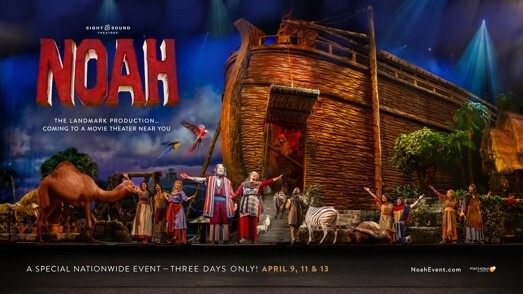 Filmed in front of a live audience, NOAH takes you on history’s best-known voyage as you board the enormous ark—along with two of every kind of animal! For locations and tickets visit NoahEvent.com. As the oldest grandchild of Sight & Sound’s founders, Katie Miller was the first member of the family’s third generation to work in the organization. Katie stepped onto the stage when she was four years old and performed as part of the cast until she was 13. Today, she serves as Corporate Communications Manager. Her unique, rich experience within the company’s formative years has helped her collaborate in everything from publicity opportunities to future succession planning. She lives in Lancaster, Pa. with her husband of 15 years and their three children. Sight & Sound Theatres began over 40 years ago in rural Pennsylvania, where a dairy farmer went from producing milk to producing purposeful live entertainment. Today that vision has expanded to two state-of-the art theaters in Lancaster, Pennsylvania, and Branson, Missouri, where Bible stories come to life on stage. Each production features Sight & Sound’s signature massive sets, special effects, and live animals. Still family-owned, Sight & Sound’s nearly 650 staff members write, produce, design, and build the original shows, drawing nearly 1.5 million audience members yearly. For more information, visit sight-sound.com.